Following the long and honourable tradition of luxury and service on the Irrawaddy, each of the Ayravata fleet is a delightful gem. Their ships have been lovingly crafted and elegantly furnished. There is no better way to experience the mystic wonders of Myanmar than in the luxury of an Ayravata ship. 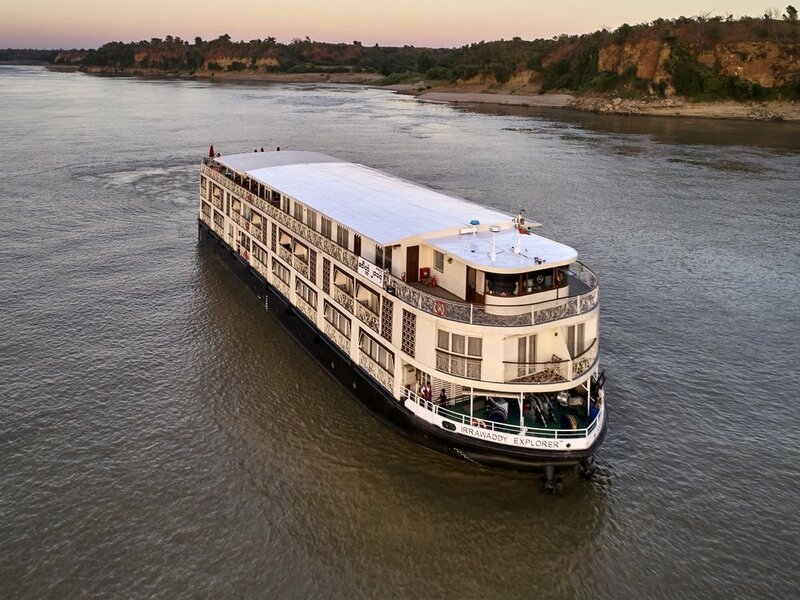 The sleek Irrawaddy Explorer is the newest and most luxurious of the fleet. Even before it leaves the dock, it takes you into another world of colonial elegance. With its beautiful art nouveau stairway, old-style furniture, gleaming hardwood floors, potted plants and classic light fixtures, it oozes colonial charm. This theme is carried into the whole interior of the ship, including the 28 luxurious suites, the Writers’ Lounge, the Custom House dining room, the Spa Room and the Fitness Centre. The 28 luxury suites are named Mandalay, Kipling, Orwell and Maugham, all with floor-to-ceiling glass doors to enjoy the magnificent views of the Irrawaddy River. Each suite comes with its own artwork. For the duration of the cruise, live in another time and place while enjoying modern conveniences. RV Paukan 2007 is a floating boutique hotel, beautifully furnished with a unique combination of modern and traditional motifs. Built in 2007 in Yangon, it can carry 55 passengers, served by a crew of 30. The timber-walled cabins are furnished with colonial style cupboards, dresser and doors. For luxury-living, RV Paukan 2007 has suites, deluxe or superior cabins as well as singles for guest or guides. There are two massage rooms on the lower deck offering traditional Myanmar massage designed to give soothing relaxation. This small cruising boutique hotel was built on the banks of the Yangon River, a place with a 200 years-old tradition of excellent craftsmanship. It is a gem of a vessel – a compact but elegant ship made of teak with a hull of marine steel. The walls and floors are of timber with each plank carefully chosen to display the beautiful grain. The décor is modern chic, with a few traditional motifs, wooden figures, fabrics and paintings to give a touch of Myanmar culture. The ship takes 34 passengers in its 18 staterooms, twin and double. All the staterooms are tastefully decorated and comfortable with a private bathroom. This elegant ship has 18 staterooms, each with a private bathroom and French balcony. It was built by the Ayravata Cruise Company at Yangon and features state-of-the-art facilities and safety equipment. Sumptuously and elegantly furnished, it sets the standard for luxury on the Irrawaddy. Relax in the lounge or lie on the sun deck as the beauties of Myanmar pass by.